The TNT Training Center opened in 1998! 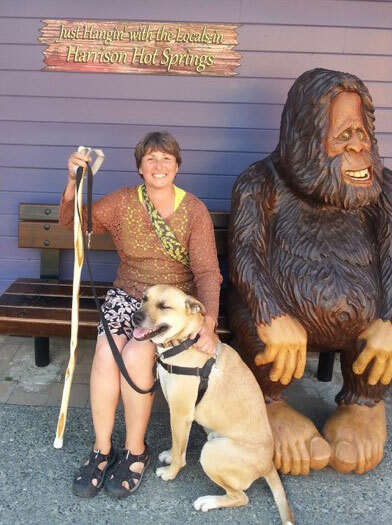 Owner, Janice Gunn is the main stay behind the training class structure. She has been training dogs for 45 years , but it’s not only her longevity in the world of dogs that has given her, her expertise. 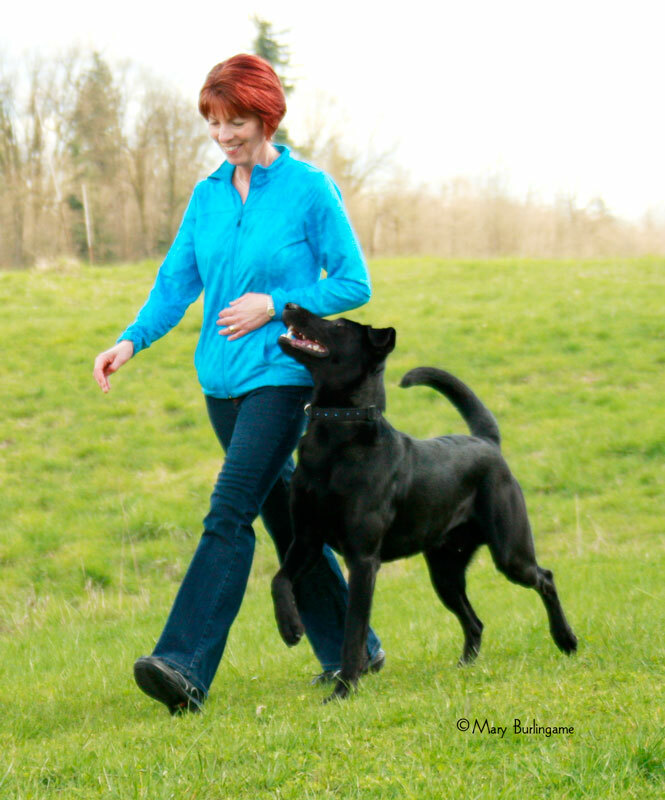 Janice has attended training seminars with some of the World’s best dog trainers. 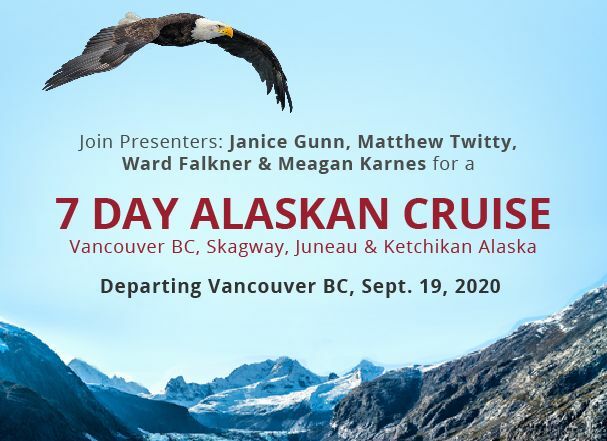 The list includes, multiple seminars with Ian Dunbar, Terry Ryan, John Rodgerson, Truid Ruugas, Patricia McConnell, Jean Donaldson, Leslie Neilson, Ken Rameriz, Michelle Pouliot, Nichol Wilde, Brenda Aloff & Sue Sternberg just to name a few! There are many others as well. Janice has also attended APDT and 6 Clicker Expo conferences these are the best of the best. 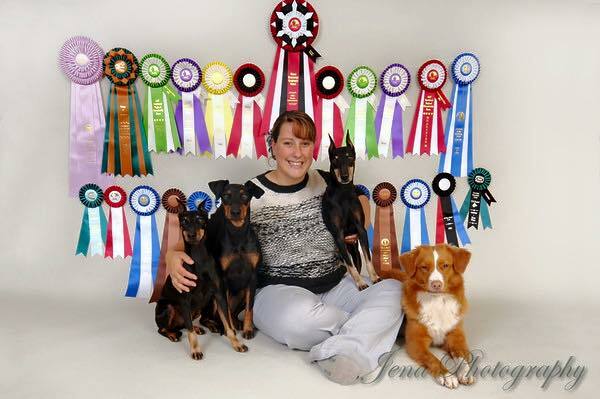 Janice has earned titles in many different venues, actually proving that she can train a dog, AND that her training follows through in competition where dogs exhibit stress and anxiety and often have a difficult time performing at their best. There is a fine balance in dog training when using food to train. Dogs learn very quickly in the presence of food, but when the treats are gone, only a properly trained dog will perform in the ring. And this requires a skilled trainer, one that understands how to find the balance between using food rewards, and yet still “teaching” the dog how to perform without food. This is why TNT is so unique, Janice and her instructors actually DO compete with their own dogs and earn titles. They are not afraid to put themselves on display and show the world that they really do know how to train a dog. Janice herself has earned titles to the highest levels. This includes titles in conformation, agility, tracking, field trials, hunt tests and competition obedience. We are confident that you can build a lasting relationship with your dog to diminish behavioral problems and expensive bills due to idle destruction or the uncooperative grooming or vet client. Decrease the stress of pet ownership and enhance your quality of life with your canine. We will teach you the skills for a healthy lifelong bond with your dog! Jane’s love for dogs has been strong since she was a child. She has had rescued many dogs through her years and her desire and love to work with dogs continues today. Jane fostered dogs for many groups and adopted a Greyhound off the track. That led to volunteering for Saint John Ambulance with her dogs in Therapy work. Jane has done volunteer therapy work with three of her dogs. Her two current Therapy certified dogs a Chihuahua, Hula Hoop and a Great Dane, Sookie. Sailor her English Cocker was 4 years old before she began training in competitive obedience with TNT. Since then Sailor has completed multiple titles including : CD (Novice), CDX (Open), RN (Rally Novice), RA (Rally Advanced), RAE (Rally Excellent) and TD (Tracking Dog), DD (Draft Dog) often with 3 consecutive legs and multiple High in Class wins. Sailor earned a Top Obedience Dog Award for 2011 from Dogs in Canada for placing first in points won by English Cocker Spaniels. The next Dog Jane had competing was a Great Dane Rescue named Sookie. Sookie is registered with the CKC with a performance number. Sookie earned a CGN (Canine Good Neigbour), CD (Novice ) with a High in Trial and High in Class wins. Sookie earned her CDX (Open) title in 2012 with two high in class scores. Sookie is ranked number one in points for a Great Dane in Obediance in Canada for 2012. Sookie has her Rally Novice and Rally Advanced titles through the CKC. She is the first Great Dane to receive a Draft Dog Title in Canada. Having passed the Draft Dog test twice she is also the first Great Dane to have Draft Dog 2 in Canada. Sookie is also a Therapy Dog with Saint John Ambulance. Jane also has her Chihuahua Hula Hoop. Hoops was supposed to be a conformation dog but after breaking her leg in an accident that dream was gone. She has been an amazing therapy dog with Saint John Ambulance since 2010. Hula Hoop earned her Canine Good Neighbour certificate in 2011. Hoops earned her Rally Novice title in 2012. Hula Hoop has also passed her Pre-Novice trial in 2012. 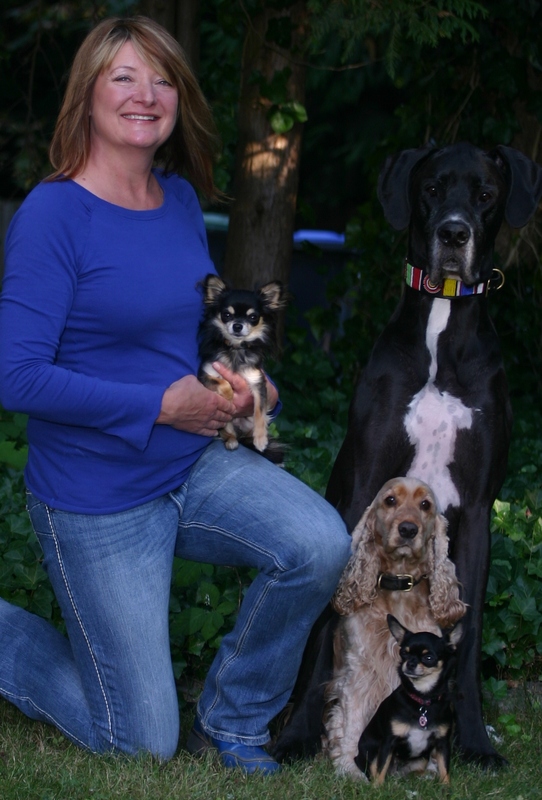 Jane is a member of the Chihuahua Club of Canada , the Western Great Dane Club and Dumbbell Obedience club. Jane Completed Dog Trainers academy in Dubuque Iowa April 2010. 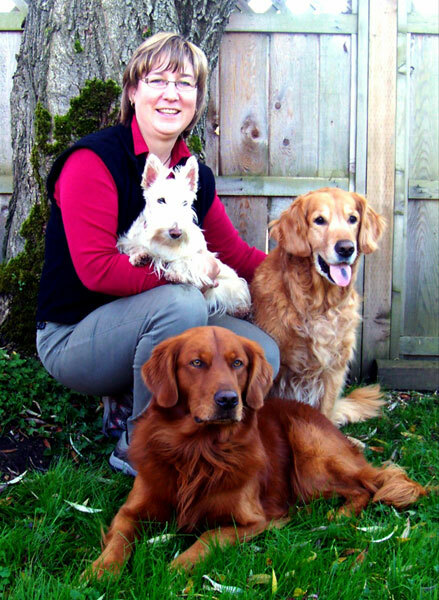 In 2014 – Jane became an official evaluator for the Canadian Kennel Club’s Canine Good Neighbour program. 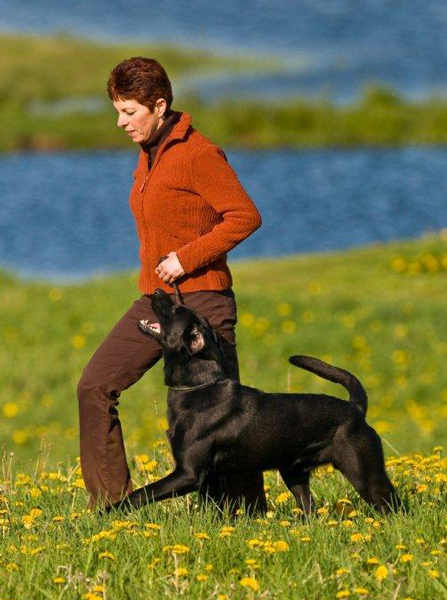 Jane has attended and participated in seminars with the following Dog Trainers and Behaviorists. Give them a scalpel & they will dissect a kiss. I was born into a family of animal lovers and truly can’t remember a time I have not been surrounded by animals of one kind or another. In my teens horses became my life and every waking moment was spent with them. My passion turned into a career of riding, training and showing horses professionally for many years. This included living in Oklahoma riding and driving horses for top training facilities. Then one day I went to watch a friend take her dog through the CGN (canine good neighbour) test and a local park. It looked like fun and I decide to put my two Neapolitan Mastiffs through the test. They both passed with flying colors and I was hooked!! I am now co owner of Michl R Kennels that has been dedicated to breeding top American Staffordshire Terriers for more that 40 years. It is an honour to be entrusted to continue this line of Amstaffs that have earned World Champions, Multiple Best In Shows around the world and Multiple High In Trials. I currently share my home with some amazing Amstaffs. Right now I am training and showing Michl R Redneck Reflection CGN CGC CDX RE HIC aka… RUSH who won his first High in Trial at 11 months of age. Rush and I along with other members of a canine vaudeville act enjoy performing skits and tricks for local seniors homes and at community events. Rush and a couple of my other dogs have also appeared on television and had small parts in movies. I have trained and competed in conformation, competition obedience, rally and cart drafting as well as trick and movie training. My goal is to help my students reach there goals and beyond with their new puppies or current adult dog. In my spare time I enjoy reading and watching training DVDs, about dogs of course! I also attend seminars to keep my skills current and up to date. 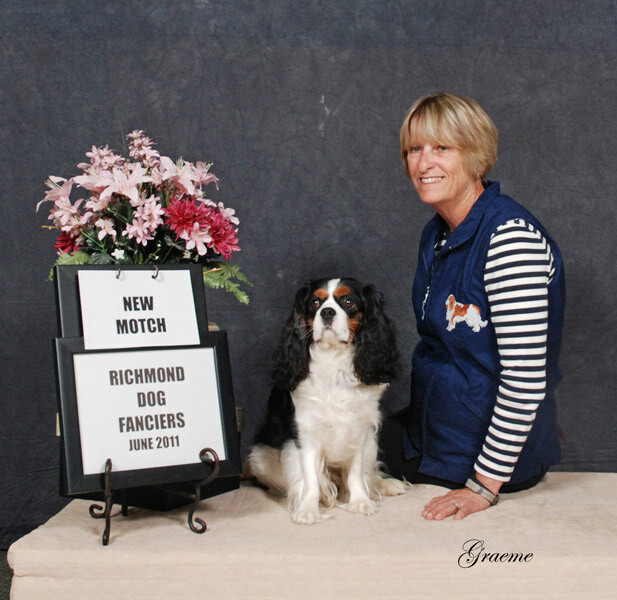 Linda has been involved with purebred dogs since 1987 and has successfully run dogs in all levels of the CKC Hunt Test program, Working Certificate programs while trialing in Competitive Obedience and breeding the occasional NSDTR litter under the “Kasomor” prefix. 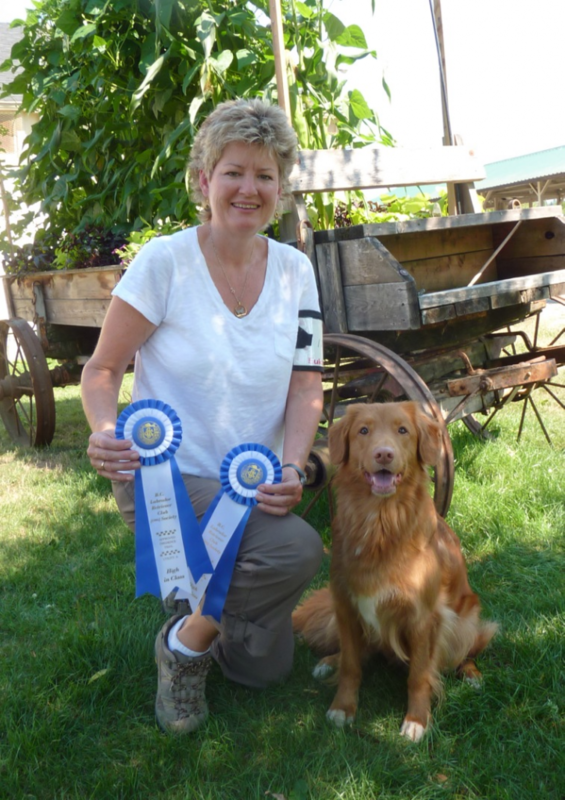 “She is a fully qualified CKC Hunt Test judge, a CKC Canine Good Neighbour Evaluator, and a Member of the CKC and Nova Scotia Duck Tolling Retriever Clubs Canada and USA. Currently, Linda is owned by three Nova Scotia Duck Tolling Retrievers; Trio, CH Westerlea’s Kasomor Trio SH WCX CDX, her daughter Tikka, MOTCH GCH Kasomor’s Wack ‘Em N Stack ‘Em SH WCX CGN and Tikka’s daughter, Kimber, Kasomor’s Pop ‘Em N Drop ‘Em JH WC. Tikka was CKC #2 Obedience NSDTR in 2013 and 2011. She is the 5th female toller to earn her MOTCH title and the first Grand Champion and MOTCH titled toller in breed history. 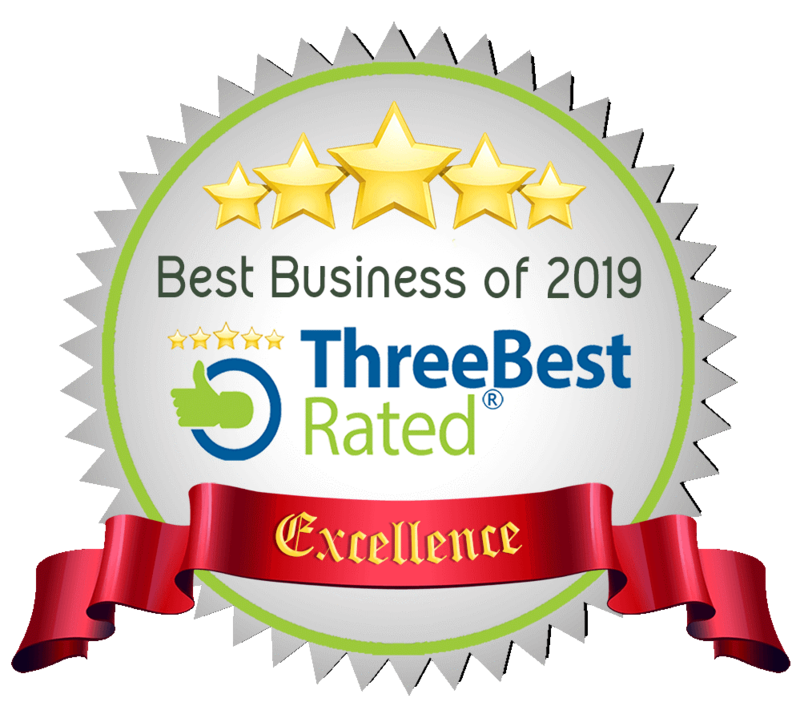 Linda takes great pride in her dogs CKC titles but more importantly in the fact that her dogs are great family pets welcome in homes, hotels and stores because of their solid obedience and manners. 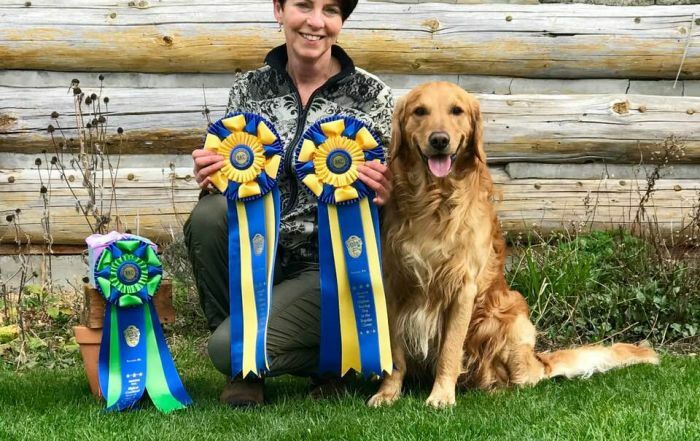 The vast majority of Linda’s obedience training, over the past 12 years, has taken place at Janice Gunn’s TNT Training Center under the tutelage of Maureen Murray. S he particularly enjoys working with young puppies and dogs and sharing her knowledge with their people to make their dogs GREAT companions!! Lâle came to Canada from Germany in 2004. Her background in teaching stems from 17 years as an equestrian where she schooled young horses and taught children how to ride. Lâle grew up with an assortment of animals and her passion continues to grow. Lâle now devotes her free time to dog training. Currently, she owns and trains a Manchester terrier named Eddie. Lâle feels that this dog has taught her many things about training as he, like many terriers, has not been the easiest dog to train! 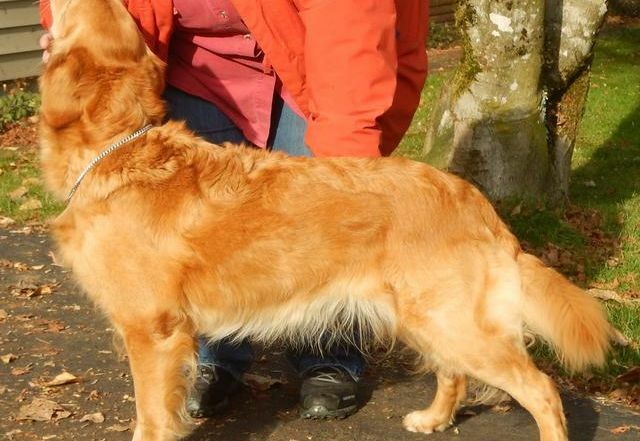 Yet, Lâle has achieved many successes with Eddie in Obedience, Rally and Agility. Eddie has his CD &Rally Excellent titles and is a Master Agility Dog of Canada. Lâle believes that all dogs can achieve success with motivational training and her philosophy is based on positive reinforcement. She feels that the dog is better able to learn when treated kindly and with positive rewards. While Lâle loves dog training, she and Eddie also enjoy long walks, playing ball and having play dates with their doggy friends. In her professional life, Lâle is the new kennel operator at TNT. She is a CARO judge and in process of becoming a CKC Rally judge. Lale is happy to be part TNT Kennels training program, and will be a top notch kennel operator! I have had dogs in my life since childhood; my husband not only got a wife, he got a dog too. I have participated in obedience since 1995; when upon becoming “empty nesters” my husband and I were looking for new hobbies. It quickly became a passion as I took our first Cavalier through the levels and attained an OTCH, the highest title available at that time. I enjoy competing with a non-traditional breed and showing that all dogs taught in the correct manner love doing their “work”. Bentley having attained a MOTCH, is supposed to be retired at 12 but he still wants to work with Mom every day. His son, Chipper, started his competitive career in May and since then has gone 13 for 13 to attain his Canadian/American CD and has 13 legs in Canadian CDX. He is currently the #1 Toy Dog in Canada in Obedience. Participation in obedience has led to other areas; I am an evaluator for St. John Therapy Dogs as well as for the CKC Canine Good Neighbour Program. I got my first Golden Retriever 12 years ago when I realized that my horse habit was getting to expensive. Since that time I have trained and titled my dogs in obedience, tracking, field trials & hunt tests, draft dog, earthdog & conformation. 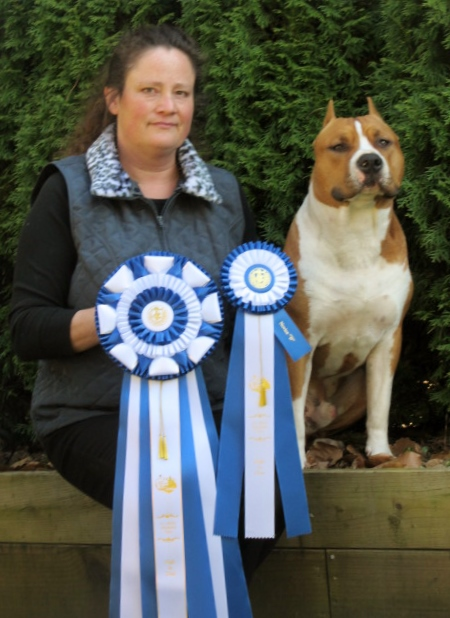 Zak was the 2nd dog to ever receive a Master Versatility Title from the Golden Club of Canada. He was the 10th dog (over 26 years) to receive the prestigious Nan Gordon award with ribbons in field, obedience and conformation. I also own a Scottish Terrier named Morgan whom I am training in competition obedience and earthdog work. My husband Rick, and son Logan are both supportive and will often be found behind the scenes as I work the dogs. Janice Gunn has been instrumental in most of my training. Our obedience base has helped us in every venue we venture into, and my dogs are excellent ambassadors when in public or just hanging in the house with the family. I am happy to be able to share my vast knowledge with my students. Now let’s have some fun training! Letsa Bantassios graduated with honors and is a certified dog trainer through the American Behavior College in California and Walks N Wags Pet First Aid certified. My love for animals has led me to a lifetime commitment working with horses and dogs. I have owned many dogs, most come to me as unwanted pets with behavioral problems that with guidance and training have become wonderful family members. The past thirty years I have provided rehabilitation and or palliative care for horses with my companion dogs always in my shadow. Timing has redirected my passion for horse care to dog training. I am a positive trainer that focuses on humane techniques and believe that all animals have unique, individual personalities I work with their personality to help them become a loved, compliant family member. I look forward to helping your dog to become the perfect family member! Allison started in 2004 working with dogs at TNT Kennels while completing high school, a Bachelor of Kinesiology degree and a Bachelor of Education degree. She is a teacher and currently teaches physical education and kindergarten. In addition to her career in education, she’s also explored canine anatomy, first aid, fitness, massage and various types of training. Allison’s family background includes an assortment of animals. She has always been around a family dog adopted from a rescue group and has participated in fostering, training and dog walking with local rescues. Her background also includes an assortment of well loved wild animals, including bears, that work in film. Allison and her husband adopted Russell, a Pointer X Chocolate Lab in 2011 as a 6 month old rescue with no training and lots of issues. He is now a well behaved canine citizen that has worked in some films, just for fun! 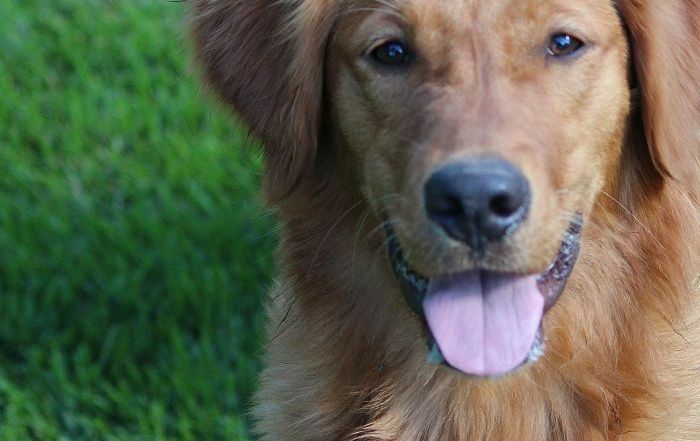 He has also been featured as the “poster boy” for a popular dog food company and is a well travelled boy that accompanies their family on all of their hiking and travel adventures. Lacey, a Yellow Lab, joined their family in 2016 as a happy puppy. Lacey visits a classroom, nursing homes and has also been featured in advertisements. 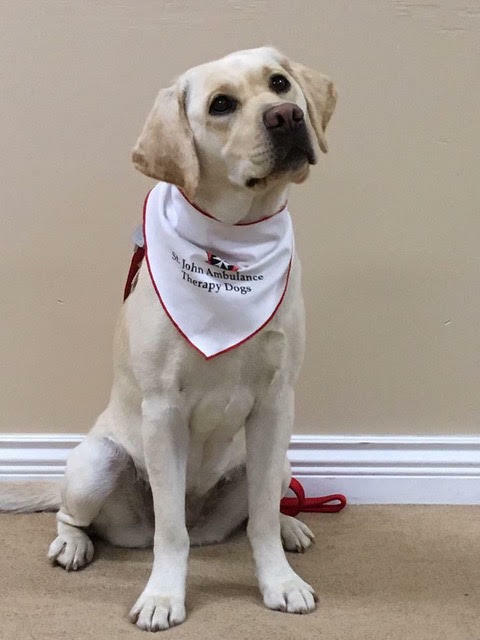 She also received her Saint John Ambulance (SJA) Therapy Dog certification in 2018 and goes on official visits with SJA.